Dark clouds and thick fog cloak the Alaska Range and surrounding lowlands, as if some gray, sodden blanket has been dropped over the landscape. 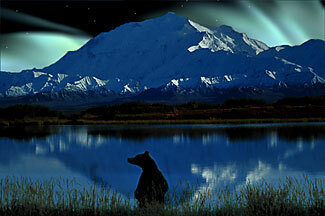 There's no hope of seeing The High One, 20,320-foot Denali (officially known as Mt. McKinley). And in all this soupy grayness, there's little hope of seeing the wildlife for which Denali National Park is famous. Given the weather and the hour - 7 a.m. on a Saturday - the 14 people on our bus might understandably be grumpy. Or asleep. Instead, we're talking, laughing, sharing stories, and taking turns on "wildlife watch." In short, we're a happy bunch, spirits refusing to be dampened by dank circumstances. There's good reason for our brightness: members of our small group have spent from two to six days in the heart of one of America's great parklands. Only two of us are Alaskans. The rest come from Iowa, New York, and France. We were strangers to one another a few days earlier. Now we're one giant family on holiday. We've been staying at a backcountry lodge with many of the comforts of home: heated rooms, hot showers, cushy beds, great food. And the lodge's employees have been eager to make our experience the best possible. But the people on this bus could have found such luxuries almost anywhere. What has made this trip memorable is the sub-Arctic wilderness and its wild residents. Beyond the reach of cellphones, TV, newspapers, and the Internet, we've been humbled by the immensity of vast, rolling lowlands and faraway, snow-capped peaks tucked beneath stubbornly persistent clouds. We've seen snow-white Dall sheep, big-antlered caribou and moose, migrating sandhill cranes, swooping falcons, and, best of all, berry-crazed grizzly bears. Bears are among my great passions. In fact, one reason I've come here is to present a program on Alaska's bears. My interest is that of a writer, naturalist, and animal lover, and I make no claims to special expertise. But once people know that I've studied bears, spent considerable time in their company, and even been charged by one, they pepper me with questions, ask me to share my stories, and tell me theirs. Everyone, it seems, has a bear story. One of the grizzly's gifts to us humans is that the animal demands that we pay special attention when passing through its homelands. In doing so, we notice things we might ordinarily miss: berries, flowers, diggings in the tundra, animal droppings. Even the sighting of a grizzly a mile away is something to be shared at dinner. Others tell how they broke into loud song when a trail took them into dense thickets, simply because a bear might be in the area. To many people, no other North American animal symbolizes wilderness and wild ferocity as much as the grizzly. Except, perhaps, the wolf. It turns out that Denali is among the best places to see wolves in the wild. But they're not seen nearly as often as grizzlies, and few people at the lodge have spotted any during their stay. This dark, foggy day is their last, best opportunity. Joe, a railroad engineer from America's heartland, is especially hungry to see a wolf. Even the briefest glimpse will do. He keeps his eyes trained on the landscape until the gray shroud grows so thick that almost nothing can be seen. Finally, the veil begins to lift and someone in back announces, "OK, Joe, time to get serious again." Minutes later, there's a shout: "Wolf up ahead!" Fifty yards in front of the bus, a black wolf nonchalantly walks up the middle of the road. Martin, our driver, shuts off the engine. Almost immediately the wolf stops and looks our way, then turns and approaches. The murmur builds. People pull down windows and reach for cameras and binoculars. As the wolf nears, Martin recognizes her as the Toklat Pack's alpha female. The she-wolf pauses, steps forward, pauses again. She looks directly at us, yellow eyes shining fiercely with intelligence. The stark contrast of dark body and bright, piercing eyes is hypnotizing to some, unsettling to others. The eyes remind one visitor of images from a horror film. Others remark on the wolf's great calm. She's clearly comfortable around buses and people, but there's no question she belongs to another, wilder world. Several minutes pass. Then the wolf continues down the road and turns back onto the tundra. There's an electrified hush before the driver restarts the bus. Then everyone starts talking excitedly. This is the encounter people will share years and decades from now: a few minutes spent looking into the gleaming eyes of wolf, which somehow reflect a deeper, wilder, more ancient part of ourselves.